Improvements and affordability have broadened the use of vision systems for inspection, but several factors should be considered before making a purchase. GLEN AHEARN, TELEDYNE DALSA INC. 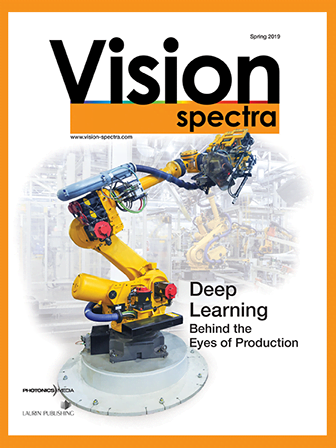 Technological advances have resulted in new, higher-quality sensors that enable machine vision cameras to deliver greater features and functionality at a lower cost than ever before. These factors are motivating businesses in a widening range of industries and sizes to pursue these new, improved and more affordable cameras. Regardless of the industry, however, there are a number of factors to consider while pursuing a vision solution. For decades, companies have been using vision systems for inspection purposes when their products are of high value or have potential liabilities if associated with a defect. Now vision inspection is becoming more affordable for companies that are interested in producing quality products, even if they are neither of high value nor pose a potential risk if defective. Examples include hardware, such as nails and screws, corrugated cardboard and plastic containers. The type of camera a manufacturer needs, whether it is a line scan or area scan camera, will depend on the application. Most people understand the technology behind an area scan camera, which is akin to a high-resolution digital camera. Area scan cameras produce 2D images with horizontal and vertical elements. Area scan cameras are used to inspect discrete components, such as pharmaceutical bottles or soda cans. Line scan cameras are more difficult to understand. Line scan cameras look at one line, and then build a 2D image by moving the object relative to the camera while continually grabbing one-line slices. If the object cannot be contained in a practical-size field of view, then consider a line scan camera. The most typical line scan camera use is for applications that involve the inspection of a “web,” such as large rolls of paper, fabric, aluminum, steel or sheets of glass. If the application is to inspect a 50,000-ft roll of paper, it is not possible to do this in a single shot from an area scan camera. A line scan camera works in applications like this because the object, such as the roll of paper, is already moving as part of the normal manufacturing process. The line scan camera compiles lines from the paper roll into multiple 2D images. If each image is 1,000 lines tall, the camera will grab 1,000 lines into one 2D image, and then pick up lines 1,001 through 2,000 for the next image, and so forth. The camera breaks the 50,000-ft roll of paper into 2D images, but nothing is lost in this process. Line scan cameras are used to inspect a ‘web,’ such as rolls of paper. The default choice for many machine vision applications is an area scan camera. If the application involves inspecting aluminum cans, glass bottles or discrete components, then this is likely the right choice. A line scan camera is used in cases where an area scan camera doesn’t make sense, such as when a higher resolution is needed than the area camera can give or the object is something that can’t be captured in a normal field of view. If the application is to inspect a discrete component, such as a can, bottle or piston, how many of these components must be inspected per second? How many components are going to be moving past a single point in space in a given time period? Is it three per second? Fifty per minute? The camera will need to acquire at least at this rate. It is preferable to have a little extra margin. If the application calls for a camera that acquires at 25 fps, choose a camera that acquires at 30 fps. This will give some room for error. Line scan cameras require a bit more math to determine the appropriate acquisition rate, but it is not terribly difficult. Once you have determined your resolution, figure out how fast the object is moving and decide how many lines need to be grabbed in a second in order to have the necessary resolution. If a pixel resolution of 3/1000 of an inch is needed, and the object is moving at 100 inches per second, that would require a minimum line scan camera speed of 33,333 lines per second, or a 33.3 kHz line rate. There are different interconnect standards to choose from and that choice is based on a couple of requirements: speed and the distance between the camera and the computer. If speed is a priority, then find an interconnect that has speeds high enough to transfer data from the camera to the host computer at the rates that are required. Some of the higher speed standards are Camera Link, Camera Link HS and USB3 Vision. Camera Link HS is one of the highest speed interconnects available, but it requires a frame grabber. USB3 Vision is not quite as fast as Camera Link HS in terms of speed. However, the USB connection typically is built right in to the computer, so it doesn’t require a frame grabber or additional piece of hardware to acquire the data. Some people choose GigE Vision because it is based on the Gigabit Ethernet specification and can go long distances between the camera and the computer. If the camera needs to be a long distance away from the computer — more than 10 to 15 m — GigE Vision is a good choice. GigE Vision is slower than Camera Link and USB3 Vision standards, but it may be the only choice if the camera is far from the computer. Light wavelength is not an issue of concern for every application. Some applications, though, will require the camera to be sensitive to certain wavelengths of light. For example, with currency inspection, there may be security features that are only visible in UV or infrared light. In this case, be sure the camera has enough sensitivity at that wavelength to execute a successful inspection. There will also be a need for a light source with corresponding wavelength properties in order to allow the camera to visualize the feature in question. For a majority of applications, white light, or broadband light, is used, and any standard camera should suffice. If the inspection involves any special lighting, be sure that the camera choice is appropriate for the light wavelength required. If there are plans to include purchasing a large quantity of cameras over time, manufacturers may be willing to offer some customization. If only one or two vision systems are needed for one or two lines in a plant, purchasing options will likely be limited to cameras available with off-the-shelf features and capabilities. However, if there is a need for 1,000 vision systems annually for several years, some manufacturers will offer a high degree of customization. In such situations, it may be possible to remove costly and unnecessary features — or add a feature that is not included in the standard product. If long-term plans include purchasing a large volume of cameras, it is worth mentioning that to the manufacturer to see if any of these options can be negotiated. Just like resolution and speed, cost is an essential factor in your purchasing decision. If, at this point, the decision has been made to buy and install a vision system, there has likely already been a determination on the technology’s cost-effectiveness and return on investment (ROI) projections. These assessments will dictate the camera budget. Just as when considering resolution, cost is going to dictate what can be accomplished with a vision system. While it would be appealing to inspect a product down to the atomic level, that degree of resolution might be cost-prohibitive. Buyers have to weigh the vision system’s cost against the ROI. One way to approach the camera selection process is by working backward, with cost being the first consideration. That will keep buyers from going down a road with a camera purchase that is going to make the cost unwieldy. • Determine a budget first, because that will set the bar for resolution. • The camera’s resolution should provide for — at a minimum — a three-pixel coverage of a feature’s area. • Select a camera with an imaging rate slightly higher than what is needed. • Let speed and the distance between the camera and the computer dictate the camera’s interconnect standard. • Make sure the camera can properly function in the lighting and environmental conditions where the inspections will occur. • See if the manufacturer is willing to customize the camera.